Stature SC Fungicide is an effective fungicide that helps control foliar pathogens and root diseases such as downy mildews and some Phytophthora species that affects ornamental plants grown in greenhouses, shadehouses, lathhouses and nurseries. It uses Dimethomorph as its active ingredient and it guarantees great performance on preventive control of root diseases. It controls all active stages in the fungal life cycle except zoospore formation/motility and it can be applied as a drench, spray or through chemigation. Stature SC goes into solution faster as a liquid suspension and is packaged in a 25 oz. container. Subdue MAXX Fungicide works systemically on ornamentals; nursery grown non-bearing citrus; turf; nursery and plantation grown conifers; Christmas trees; and nursery grown non-bearing deciduous nut and fruit trees. 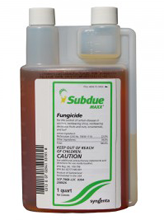 Subdue MAXX Fungicide is formulated as a microemulsion concentrate that controls Pythium blight. Subdue MAXX Fungicide is odorless and is stable and compatible when tank mixed. Not recommended for Downy Mildew on Roses! 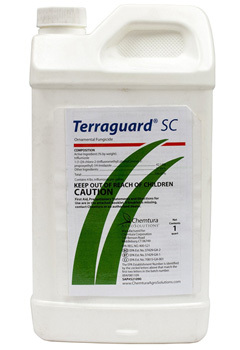 Terraguard SC is a locally systemic fungicide that provides protection of hard to control diseases. Terraguard SC can be used as a cutting soak, soil drench, foliar spray or through chemigation for control of diseases on ornamental plants grown in enclosed commercial structures such as greenhouses, shadehouses and interiorscapes. It prevents diseases from attacking leaf surfaces as it penetrates the plant (where applied) to stop disease development. The chemical action of Terraguard SC makes it the ideal fungicide for fighting foliar as well as soilborne diseases. If you are looking for a great new fungicide for your greenhouse, Trinity may be the answer. It provides widespread control of plant diseases including cylindrocladium, powdery mildew, botrytis, rhizoctonia and fusarium. It is for use in closed commercial greenhouses on flowering hanging baskets, potted flowering plants and ornamentals, bedding plants, cut flowers, foliage and perennials. 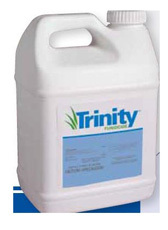 Trinity fungicide can be applied as a single foliar spray or tank mixed with other ornamental fungicides. Trinity fungicide provides a broad range of disease control on ornamentals, including bedding/potted plants, container-grown plants and nursery field-grown plants. Trinity fungicide is now labeled for use in greenhouses, lathhouses and shadehouses, containers, outdoor and field nurseries, including Christmas tree and forest or conifer plantations, retail nurseries, residential and commercial landscapes, interiorscapes and other non-turfgrass landscape areas located at golf courses, recreation areas and parks. Usage is 1/3 - 2/3 teaspoons per galllon of spray material. See label for specific issue. THIS PRODUCT IS REGISTERED FOR USE IN CALIFORNIA. 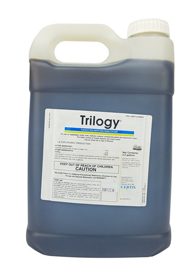 Trinity® TR total release fungicide broad spectrum control of several key diseases such as: Alternaria, Botrytis, Cylindrocladium, Fusarium, Myrothecium, and Rhizoctonia. Trinity® TR total release fungicide is a foliar applied product and will not control soil borne pathogens that infect below the soil surface. Trinity® TR total release fungicide offers users a convenient and efficient application method with thorough coverage, excellent plant safety and flexible re-entry times. Customers note: Trinity TR was created to replace Fungaflor TR which is no longer available. Not available for sale to California HOWEVER, TRINITY LIQUID IS REGISTERED FOR CA AND FOR SALE IN 64OZ BOTTLE. New for Powdery Mildew and Rust control on ornamentals. If you have been using Eagle for years, now is the time to change to the next generation of mildew control. Trionic Fungicide delivers effective control of powdery mildew on a variety of crops. Trionic is a sterol-inhibiting fungicide that inhibits the ergosterol biosynthesis pathway and membrane function within the fungal pathogen. By providing locally systemic activity, as well as protectant & curative benefits, Trionic should become a key component in your disease management program. Same active ingredient as Terraguard but at a much lower price! Usage rate on ornamentals is 1/4 to 1/2 teaspoons per gallon of spray solutions.